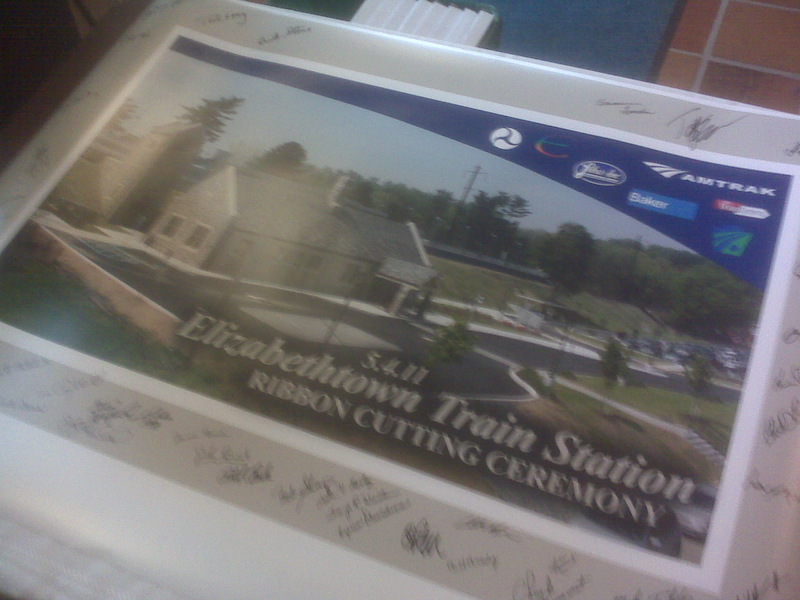 After at least 13 years of debate, discussion, design, redesign and more discussion and debate, the Elizabethtown Train Station was rededicated Wednesday, May 5. The station received a $9.3 million facelift thanks to funding from the American Reinvestment and Recovery Act (ARRA) and planning from borough officials since the late 1990s. Because the station had already been designed, it was considered "shovel ready" when President Barack Obama signed ARRA, commonly known as the federal stimulus. 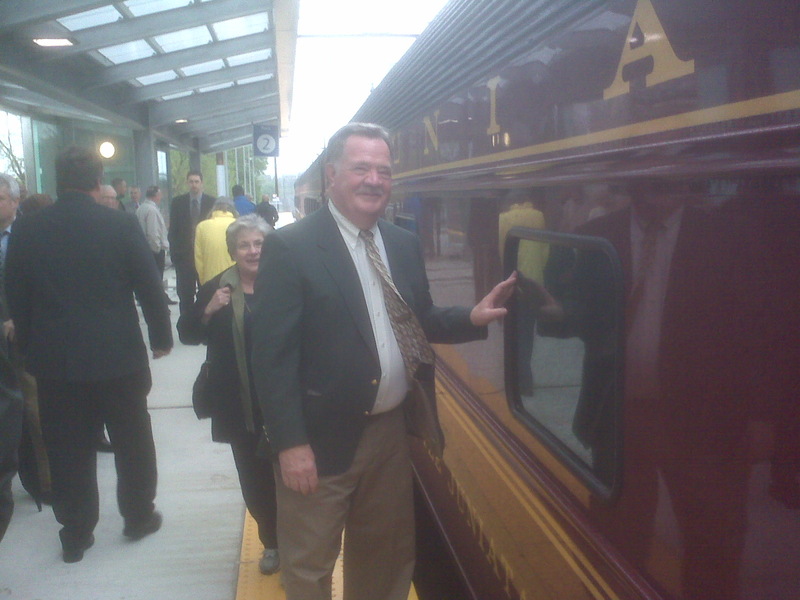 Wednesday's ribbon cutting brought borough officials, including all members of Elizabethtown Borough Council, a deputy secretary from the Pennsylvania Department of Transportation, an executive from Amtrak and the regional director for the Federal Transit Administration, along with dozens of community members. All gave high praise for the station, which now services 95,000 trips compared with 37,000 trips in the early 2000s. 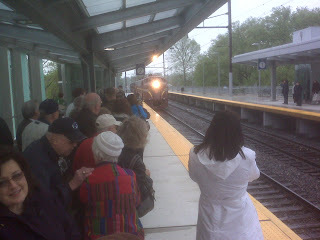 The weather on Wednesday did not cooperate for an outdoor ceremony, but the driving rain did allow for an adequate demonstration of how the awnings over the platform do protect passengers waiting for trains to arrive. 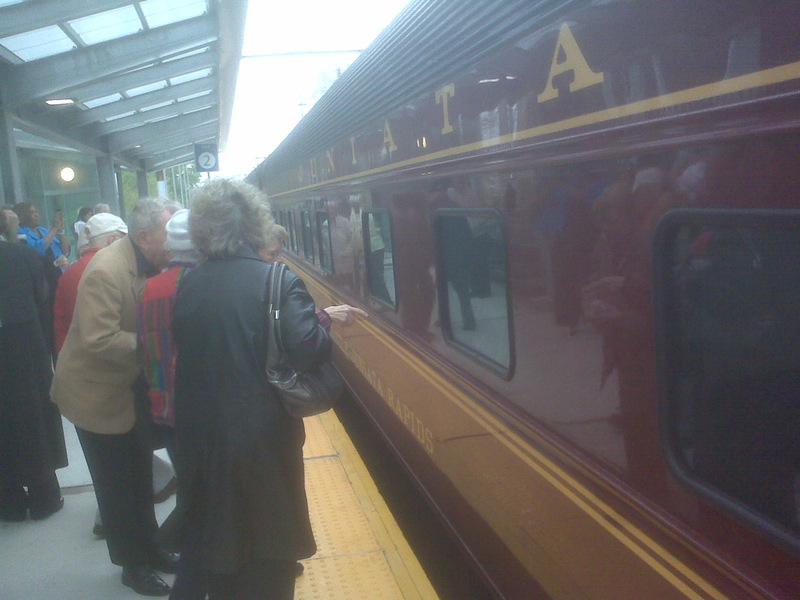 Before the event started, a renovated historic Pullman train pulled into the station, allowing those gathered to peer into the windows. After the train pulled out, everyone moved inside the old train station, where the waiting room has been renovated to a period look. In time, train riders will be able to purchase tickets from two ticket kiosks in the station. The station will also receive an LED message board that will show how many minutes a train is from arriving, allowing riders to wait inside in cold or inclement weather until literally the last minute before a train arrives. 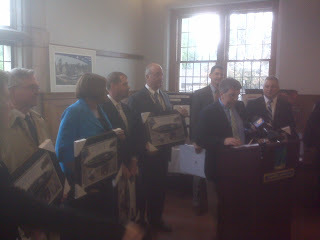 Elizabethtown will be the first stop along the route from Philadelphia to Harrisburg that will have the message board. The station is truly a gem for our community and will be a huge boost in the arm for economic development for Elizabethtown. 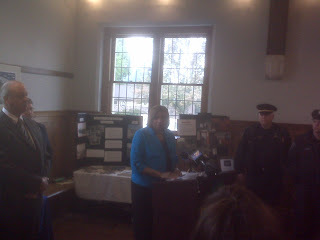 Much credit goes to members of Borough Council from the last 15 years whose leadership helped make the station a reality. In addition, Borough Manager Roni Ryan oversaw the construction that started 1.5 years ago -- right after she was promoted to the job upon the retirement of long time Borough Manger Pete Whipple. In many people's eyes, Whipple is the real leader of the project, who continued to make it a priority despite many challenges and setbacks. 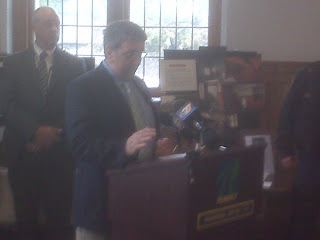 It was through his efforts working with PennDOT that the borough was able to secure the stimulus funding. Continue to scroll down to see other photos from the ceremony. Mayor Chuck Mummert checks out the Pullman train. 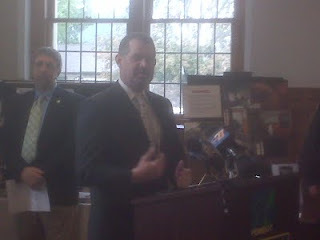 Borough Council President Phil Clark welcomes the crowd. A poster showing the renovated station. Clark with all who played a part in making the station a reality. 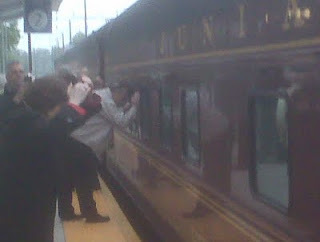 I dropped my daughter off on Saturday to use Amtrak to Philadelphia. It was great to be able to use the rest room facilities, ticket machine, and elevator. Sadly, I noticed graffiti in the westbound stairwell. It would be nice if you could get volunteers (maybe Masonic retirees) to keep an eye on the place during non-business hours. No one with any authority seemed to be around on Saturday morning. Thanks for the message about the graffiti. I've passed it along to the borough staff so they can assign someone to get it cleaned up. We are working to ensure that the train station is secure and have talked to Masonic Village about having volunteers there. 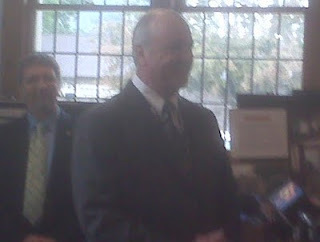 The station is definitely a gem for our town. We want to make sure it remains that way. I am excited to use the revamped station finally. I heard about this when it was to happen and I nearly hit the roof. I used to imagine what the insides of those old abandoned buildings used to look like and how it used to look in 1915 when it was functional! And now I can. I am excited to be able to use the QuikTrak kiosks finally- though I have never been refused from a train ride because of full capacity, I often worried about it. Will there be any outdoor ones soon with extended service hours (if there aren't already)? I think trains are becoming a more affordable way to travel in this day and age and I can be very proud of my station now! At the moment, there are no plans for outdoor kiosks. When you can't get a ticket inside, you'll still be able to buy one from the conductor on the train. One more thing that would be nice- a weather-proof shelter on each platform. It's brutal standing up there in freezing weather waiting for a late train!